After what seemed like years of keeping the movie under their hats, Fox has finally started releasing a ton of images from X-Men: First Class, all of which you can find at our Blend Film Database. But somehow even cooler than actual images from the film is concept art, the sketches and renderings that the costume and production designers worked with to create their vision of the film, maybe even before the actors got to the set. 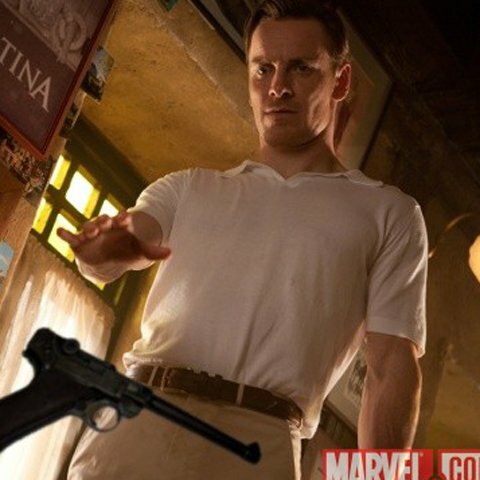 Today Marvel.com is debuting four of those type of concept art images, plus a new shot from the film of Michael Fassbender, as Magneto, levitating a gun in the air. I think what I said above about concept art being even cooler than images doesn't apply when supermagnetic powers are involved. Check out two of the concept art designs, including the one showing off the super-60s design of the evil lair the Hellfire Club, plus the Magneto image, below, and click on them for the full collection at Marvel.com. X-Men: First Class opens next Friday, June 3, and you will definitely be reading much, much more about it in the next week, including my report from the film's press conference in New York earlier this week. It's time to get excited about mutants again!